Hardwood flooring is a beautiful and durable option for your kitchen! Are you looking to do something different with your kitchen this year? You should consider upgrading hardwood flooring! Hardwood is a beautiful, durable and versatile addition to any kitchen. When you’re doing your research for how to redo your kitchen, you will notice that hardwood flooring is a popular option. It can help give your kitchen a warmer feeling, which is definitely appreciated during the chilly days and nights of winter. This alone makes it better than other potential flooring types such as tile, linoleum, and vinyl. The latest trends have been moving towards the kitchen being open, and as such, combining different types of flooring is harder to do. Another reason to choose hardwood flooring is that it will last. One major concern when it comes to putting wood floors in a kitchen is all of the water and plumbing that is present. How will all that moisture affect your floors? Luckily, by using rugs and mats near sources of water, you can prevent water damage to your floors. Plus, the only place in the kitchen where the flooring won’t be installed is around the dishwasher. This provides another layer of protection against potential water damage. 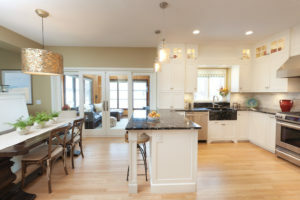 Finally, installing hardwood flooring into your kitchen has some unexpected benefits as well. When your floors are made of tile or ceramic, these materials can cause you pain, especially in your knees and back. You’ll also need to spend time cleaning up the grout. Both of these issues are no longer a problem when you install hardwood flooring. Plus, it can also help increase your home’s value. This entry was posted on Friday, January 18th, 2019 at 4:57 pm. Both comments and pings are currently closed.